For GOCC Event Alerts Sent to Your Phone, Text GOCCALERTS to 84483. The list of events below are not sponsored by GOCC, but are being provided here as a convenience for our readers. Please contact the Park or event organizer for details. Would you like to see what we have done at some of our past events this year?... Check out our event archives below. 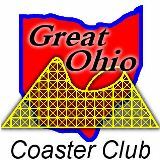 All Contents Copyright © 2019 Great Ohio Coaster Club Inc. All Rights Reserved.